We are proud to inform you that we are the only authorized distributor of Light Force performance Lights for the territory of India. We bring you the best performance lights from LightForce Australia.We also looking for Dealers. The 240 XGT is built on the award winning HID type housing and mounting system incorporating a 12V Xenophot® 100 watt bulb. Without doubt our most popular light and for good reason! The combination of inherent mechanical strength and powerful output have made this the choice for off-road racers and the hard-core enthusiast worldwide. We are proud to inform you that we are the only authorized distributor of Light Force performance Lights for the territory of India. 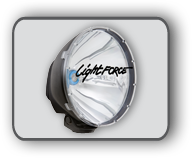 We bring you the best performance lights from LightForce Australia.